Bonnie Young is currently the Director of Coaching for U11-U19 Girls at FC Boulder. She has over 15 years of experience in coaching and club leadership across all levels, from recreational soccer through women’s professional soccer with the Chicago Red Stars and the Washington Spirit. Her professional playing career included time with the New York Power (WUSA) and the Chicago Red Stars (NWSL) along with W-League stints with the New Jersey Wildcats and Sky Blue Soccer. Originally from Houston, Texas, Bonnie played collegiately at Penn State University, where she studied Kinesiology. She earned her Master of Science degree in Human Movement and Corrective Exercises from the Arizona School of Health Sciences. 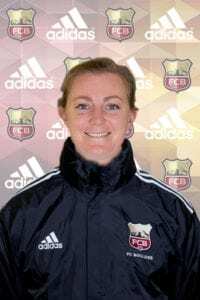 Bonnie has also earned her Premier Diploma and Director of Coaching Diploma from the NSCAA and has her USSF “B” License in addition to being a Certified Strength and Conditioning Specialist (CSCS). So she’s incredibly qualified to be BETC’s soccer consultant for The Wolves, and we’re extremely excited to have her help on this production! What attracted you to playing women’s soccer in the first place? I had played a ton of sports going up and it came down to basketball and soccer to play in high school. I had to choose between the 2 for college and my soccer options were greater (and took me to a school I loved!) so soccer was it. When I really honed in on one sport, I grew to love the game and grew as a player. What kind of training does it take to coach well, beyond being a player? You’re a teacher. Having a background in education helps, but there are a lot of licensing courses for coaches. US Soccer has a licensing process from D through A. It’s a pretty intensive process. Again though, the main attribute is the ability to teach. If you played some, but you have the ability to teach and connect with your athletes, you’ll likely be a successful coach. If you could give one piece of advice to high school girls’ soccer players, what would it be? High school girls soccer players should train like they play the game and enjoy competing. You’ll learn by playing at game speed and competing makes it fun! With all of the pressure of winning, recruiting, performing in front of friends and family – players can lose sight of the fun. What’s it been like to apply your soccer expertise in a theatre situation? It’s been so much fun. The actors are actually asking me to be harder on them and critique them more because of their desire to look just like a soccer player. Which is great! I have to keep working with improving the technique of different skills first, before we move on to anything fancy! Their desire to learn and try to perfect technique has been fun to work with. What’s your favorite part of working on this production, so far? It’s challenging me – in a great way! My challenge is: can I communicate quickly and efficiently to help these ladies learn soccer skills and techniques? We’re starting with basics, but they pick things up much quicker than youth soccer players, so I can challenge them and advance them a little bit faster. See what our actors learned from Bonnie’s coaching when you come to BETC’s production of The Wolves, running October 27-November 18 in the Carsen Theater at the Dairy Arts Center, 2590 Walnut Street, Boulder, CO. For show information and tickets, go to: betc.org/wolves.